The Illinois Physical Therapy Association gives several awards that recognize the efforts of clinicians, educators and leaders toward the advancement of the physical therapy profession. Dawn Stackowicz, PT, DPT, MS, CCS is the recipient of the 2016 IPTA Clinical Educator of the Year Award. This award honors and recognizes a clinical educator of physical therapy who has consistently demonstrated significant contributions to the quality of clinical education. Dawn is a full-time clinician at Stroger Hospital of Cook County where she has worked for over 20 years. Dr. Stackowicz continues to serve as a clinical instructor despite the fact that she has been assuming increasing administrative responsibilities. Dr. Stackowicz earned her entry level PT degree, a Master's degree and a transition DPT all from Rosalind Franklin University of Medicine and Science. Dawn's clinical expertise is in acute care and cardiopulmonary physical therapy and shares that expertise with her student trainees at Stroger, through adjunct faculty positions at Rosalind Franklin and Governor's State University and by mentoring physical therapists who are pursuing certification as Cardiovascular and Pulmonary Specialists from the American Board of Physical Therapy Specialties. Dawn has been recognized as a Cardiovascular and Pulmonary Clinical Specialist since 2004 and has been a credentialed Clinical Instructor since 1997 and an Advanced Certified Clinical Instructor since 2011. Dawn's nominators cite her commitment to lifelong learning, her enthusiastic sharing of her passion for physical therapy with her students and her ability to provide a quality learning experience in a challenging clinical environment. Thank you, Dr. Stackowicz, for your many years of service in educating physical therapists. 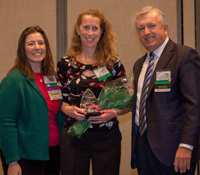 Meghan Simonetti, PT, DPT, MSHA is the recipient of the 2016 Emerging Leader Award. This award recognizes active members who are developing leadership skills at the state or district level. Meghan is a full-time clinician at Body Gears Physical Therapy. Dr. Simonetti graduated from Rosalind Franklin University of Medicine and Science in 2014. 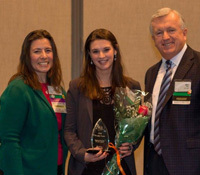 Meg demonstrated her leadership well before graduation by playing a key role in the reinvigoration of the Illinois Physical Therapy Association Student Special Interest Group serving on the Board of Directors. 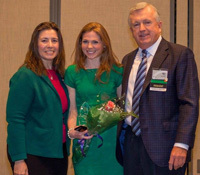 In addition, Meg served as a Director on the APTA Student Assembly Board of Directors prior to graduation. Since graduation Dr. Simonetti has continued to put her energy in professional activities serving on the APTA's New Professional Project Committee, on the Advisory Group for Perspective Magazine (an APTA publication for early career professionals) and most recently being selected to serve on the APTA's RETEAM task force, has been elected Vice-Chair of the IPTA Northern District. Meg's nominators identify Meg as an idea person, who has the energy and organization skills to take an idea and turn it into a reality. They say that among her leadership skills are her ability to act as a role model for action and to use her passion for the profession to engage others. Thank you, Meghan for demonstrating leadership within the IPTA. 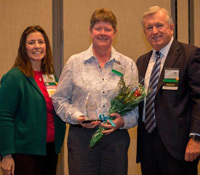 Kathy Hall, PT, EdD is the recipient of the 2016 Physical Therapist of the Year Award. This award recognizes a PT who over the past year has demonstrated a significant contribution in the areas of practice, public relations, legislation, education or membership. Kathy is an associate professor of Physical Therapy at Midwestern University and a part-time orthopedic clinician at Fyzical Therapy & Balance Centers and is recognized for her expertise in osteoarthritis and health and wellness. Dr. Hall plays a critical role in the Midwestern Physical Therapy program teaching in the Doctor of Physical Therapy Program, serving as an advisor and committee member to post- professional students, teaching in the Doctor of Health Science program and mentoring new faculty in instructional design and evaluation of learning. On the national level, Kathy has been instrumental in the development of workshops for new faculty members and an active member of the Education Section serving on the Board of Directors for six years. Dr. Hall's nominators were anxious for her to receive this award in part because her personal humility has contributed to her long term contribution being under recognized. They cite her insightful mentoring, her strategic thinking and her willingness to devote her energy to the development of others as very worthy of this award. Thank you, Kathy for your contributions and service in PT. Lauren Toner, SPT is in the final year of the DPT program at Rosalind Franklin University of Medicine and Science. Those who qualify for the award are outstanding SPTs or SPTAs who exhibit superior scholastic ability and potential for future professional contribution. Lauren has been an active participant in the IPTA Northern District and a leader within the student body at Rosalind Franklin. Lauren has shown a remarkable ability to get maximum benefit from her physical therapy education. In addition to managing her own coursework, she has served as a teaching assistant in kinesiology and orthopedics in the Rosalind Franklin DPT program and as an Anatomy Lab Volunteer in a North Chicago high school and serves as a Student Ambassador. She has also engaged in scholarship including poster presentations at the 2015 IPTA Revitalize Conference, and the Association of Schools of Allied Health Professionals. Her nominators recognize her for some critical characteristics that are essential to professional success including intellectual curiosity, respect for others and the willingness to work hard to achieve her goals. Thank you, Lauren for demonstrating outstanding leadership and superior scholastic ability.